Most U.S. buildings currently in use will continue to be until 2050 and, eventually, will require renovation. Helping building and property managers evaluate and maximize the benefits of window system renovation and upgrades, Apogee Enterprises, Inc.’s Building Retrofit Strategy Team offers a new 28-page publication. “Window replacement: Unrealized benefits to building owners” is available free for download at http://www.apog.com/documents/ApogeeRetro_WhtP.pdf. “Replacing aging windows with new, high-performance systems provide a better environment for the building’s occupants and greater value for the building owner,” says John Bendt, vice president of Apogee’s Building Retrofit Strategy Team. Describing these benefits and best practices in achieving them, the paper shares nine case studies along with detailed considerations regarding energy payback, fossil fuel savings equivalents, code compliance and green standards, environmental stewardship, tax credits, product selection and renovation specification tips, plus a glossary of industry terms and acronyms. The paper’s projects range from the 1800s to the 1970s with geographies from Boston to Portland, Oregon, and include the State University of New York (SUNY) Fredonia Campus’ Andews Complex featuring Tubelite‘s storefront and entrance systems. As many of the project examples demonstrate, re-cladding and renovating building exteriors with high-performance window systems can have a significant affect on the building’s energy efficiency. To compare performance data between a building’s existing windows and proposed, new, high-performance, replacements units, Apogee’s Retrofit Strategy Team offers free energy modeling that provides building performance information on annual energy, peak demand, carbon emissions, daylight, glare, and condensation. “Looking beyond simple energy payback, today’s owners and facility managers consider all the factors involved, including carbon footprint reduction, maintenance savings, and safety and occupant productivity,” adds Robbins. When window replacement is timed in conjunction with an HVAC system upgrade, significant reductions in peak load can yield further savings in equipment costs. For building owners seeking enhancements in security, design criteria for façade renovation also can include blast hazard mitigation, hurricane impact resistance, electronic eavesdropping protection and forced entry deterrence. “Establishing clear goals, priorities and expectations for building envelope maintenance and renovation will significantly contribute to future success. Working with an experienced building envelope retrofit team that includes the installer and manufacturers, building owners and facility managers will optimize the intended benefits and return on investment,” concludes Bendt. 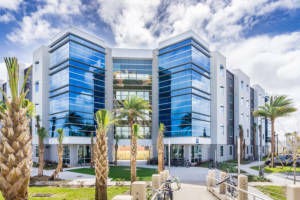 Embry-Riddle Aeronautical University’s newest 650-bed student residence hall opened in January on its Daytona Beach, Florida campus. The new $25 million, 145,000-square-foot facility designed by PQH Group showcases an ultra-modern look, natural light, campus views, and comfortable living and learning environment. Contributing to these goals, Tubelite Inc. provided window, curtainwall, storefront and entrance systems, and an airfoil fin, to meet the project’s required aesthetic, sustainability and performance specifications. As an iconic gateway to the university, the new student residence now offers five stories of semi-suite style living to students. Along with the private and semi-private living spaces, each of the building’s wings contains a lounge, study room and laundry room, plus a ground floor with community space. PQH’s partner-in-charge Ricardo Quiñones, Minozzi and their colleagues emphasize that collaboration was essential. According to Minozzi, working within the project’s budget and timeline were challenging, and critical. He explains that the university was eager to replace the outdated McKay Hall as part of its master plan. To match the plan, the new student residential hall broke ground in March 2016 and was fast-tracked for an on time completion in 11 months. The quick-paced schedule allowed McKay Hall’s 420 students to move into the new student residence after their winter break. Once they were in their new home, McKay could begin demolition in Feb. 2017 and make way for another new residential hall. In total, Tab Glass & Window selected and installed 10,000 square feet of windows; 15,000 square feet of curtainwall; 14 door leaves and an airfoil fin that extends 10 inches from the building. “We incorporated the fins as part of the building’s architectural vocabulary to create a very modern, high-tech look, while maintaining a certain hominess as these are the students’ residences,” says Minozzi. Koskosky agrees that early involvement and being “part of the team” were key factors to the project’s overall success. Similarly, he credits Tubelite’s collaborative approach. Tubelite provided Tab with its 400CW and 400SS Series curtainwall systems, 4500 Series storefront systems, and Medium Stile Door leaves. Helping make installation as easy as possible, Tubelite doors’ steel tie-rod construction can be modified, disassembled or resized right in the field. Also contributing to quick, accurate installation, Tubelite’s 400 Series curtainwall systems use exterior screw-applied pressure bars to secure the glass in place and snaps fit with a cover plate to conceal fasteners. Tubelite’s 400CW Series curtainwall’s durable framework provides exceptional structural performance, reducing the need for steel reinforcing. The curtainwall can withstand winds of up to 90 miles per hour, meeting the specified performance design criteria for the climate and location. 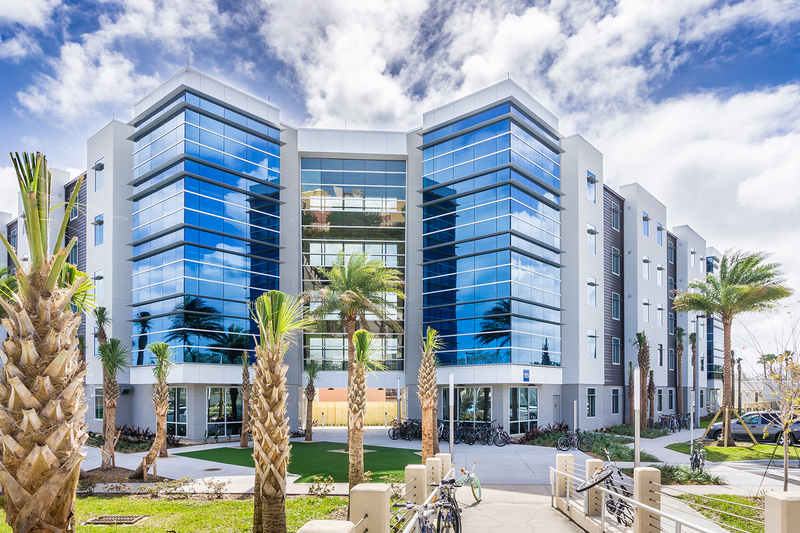 Along with mitigating the high winds on this new student residence hall, Tubelite’s systems feature Viracon glass to help manage Florida’s sunshine, maximizing the window-to-wall ratio and exceeding current domestic energy code requirements. Viracon VUE-30 low-e glass delivers an industry-leading solar heat-gain coefficient of 0.18. Viracon VE-2M and VRE1-59 also was installed as part of the project’s 25,000 square feet of vision glass. These products contribute to students’ comfort and views, allowing for more natural light and less potential glare, while balancing light with energy savings and low UV transmittance. Also contributing to the Embry-Riddle’s new student residence’s high-tech look and high-performance functionality, Linetec anodized all of the Tubelite systems’ aluminum framing members to enhance the metallic appearance and durability. Anodized aluminum resists the ravages of time, temperature, corrosion, humidity and warping, with minimal maintenance under Florida’s extreme coastal conditions and the students’ daily use. Embry-Riddle serves nearly 29,000 full-time students at its two residential campuses in Daytona Beach, Florida, and Prescott, Arizona, and through its Worldwide Campus of more than 125 locations in the U.S., Europe, Asia and the Middle East, plus a virtual presence via online learning covering every continent on the globe. It is recognized as the world’s oldest, largest and most prestigious university specializing in aviation and aerospace, and celebrated its 90th anniversary in 2016. Located about one hour’s drive from Detroit, the Blue Water Convention Center (BWCC) is the largest project in Michigan’s St. Clair County for more than a decade and the final piece of the private-public redevelopment offering waterfront views in the City of Port Huron. Tubelite 400 Series curtainwall frames the enviable riverside views showcased inside BWCC, as designed by Progressive AE. The 40,000-square-foot, $9 million event facility’s Great Lakes Reception Hall presents a grand welcome with 22-foot-high, floor-to-ceiling windows that lead to the patio. A ballroom, several breakout rooms and 20,000-square-foot exhibit hall round out the floor plan and views. Preferred Glass Inc. installed Tubelite’s curtainwall systems throughout BWCC, under the guidance of Orion Construction. “Every header was at an angle, creating a custom opening,” noted Howard Beindit, president of Preferred Glass. Making installation as easy as possible, this curtainwall uses an exterior screw-applied pressure bar to secure the glass in place. The curtainwall can withstand winds of up to 90 miles per hour, meeting the specified performance design criteria for the climate and location. According to Seth Horton, PE, project manager with architecture and engineering firm Progressive AE, managing solar heat gain was a key consideration when determining use of the curtainwall. Tubelite’s curtainwall features a low-e glass with a solar heat-gain coefficient of 0.38 to allow for more natural light, while keeping the convention goers comfortable in all seasons. Ensuring the curtainwall could withstand both the exterior exposure to the elements and the interior demands of high traffic, Linetec finished all of Tubelite’s 7-inch-deep aluminum framing members for the curtainwall in Clear Class I anodize. Unlike other finishes, anodizing highlights aluminum’s metallic appearance. This high-performance finish meets or exceeds the American Architectural Manufacturers Association’s stringent standard, AAMA 611. Because it is an integral part of the substrate, the anodic coating results in a hard, durable substance providing excellent wear and abrasion resistance with minimal maintenance all contributing to the project’s long life cycle. Part of a successfully completed, four-year economic development plan, the new BWCC celebrated its grand opening in April 2015. It connects to the DoubleTree by Hilton hotel and Freighters Eatery & Taproom. More than 900 hotel rooms in the area support event functions at the BWCC and at the nearby Baker College’s Culinary Institute. The convention center complex is anticipated to generate nearly $20 million in private investment and approximately 200 jobs, in addition to thousands of new visitors annually to the community. Michigan’s Novi High School‘s new $3 million fitness center replaces an outdated weight room that served only a few of the 2,000 students. Now a modern facility, it welcomes everyone, including 30 varsity sports teams and 10 physical education classes per semester. Featuring a glass and metal curtainwall by Tubelite Inc., the new fitness center offers natural light and views overlooking the north end zone at the school’s Wildcats Stadium. Opened at the start of the 2016-17 academic year, the 5,700-square-foot space more than doubles its predecessor. Novi High’s new fitness center contains both a traditional weight room and a large area outfitted with six treadmills, six elliptical machines, five stationary bikes and other cardiovascular equipment. “No matter if you’ve ever lifted a weight or done cardiovascular training, whether you are on a sports team or not, there’s something there for everybody,” said Novi Community School District’s assistant superintendent of business and operations, Steve Barr. Barr oversees construction projects in the school district. During the planning stage, he and TMP Architecture‘s chair John Castellana, FAIA, REFP, held visioning sessions with students, coaches and physical education teachers. With their feedback, the new fitness center’s design was refined into a cohesive, functional space plan. Working closely with construction manager McCarthy & Smith to bring this vision to reality, glazing contractor Preferred Glass Inc. selected and installed Tubelite’s 400 Series curtainwall systems. “The Tubelite system offered the necessary flexibility to craft a unique design. This success of this project incorporated a concave curved wall façade with an acutely angled corner condition,” describes Castellana. “These measurements allowed the vertical members of the curtainwall to center on the exposed structural steel columns and hold tightly to the curvature of the building’s footprint with precisely mitered horizontal members where they meet the vertical members,” says Carte. Contributing to the project’s attractive appearance and durability, all of Tubelite’s 7-inch-deep aluminum framing members for the curtainwall were painted by Linetec in a Bone White color. Using a 70 percent polyvinylidene fluoride (PVDF) resin-based coating, the finish meets or exceeds the American Architectural Manufacturers Association’s stringent standard, AAMA 2605 high-performance exterior specification for a lasting positive impression. The nearly floor-to-ceiling curtainwall system frames the “spectacular views” sought by students to enjoy while they work out in the facility. The new 28,000-square-foot GRAMMY Museum® Mississippi opened in March 2016. The one-story museum’s façade and 30-foot-tall lobby features Tubelite Inc.‘s curtainwall and entrance systems. Owned and operated by the Cleveland Music Foundation, the Museum is located in Cleveland, Mississippi near the campus of Delta State University, home of the Delta Music Institute, which features the most unique audio recording facilities in the South. GRAMMY Museum Mississippi is the first GRAMMY Museum site outside of Los Angeles. It is similar to its sister museum, the GRAMMY Museum® at L.A. LIVE, in its dedication to exploring the past, present and future of music, and the cultural context from which it emerges. The Museum focuses the spotlight on Mississippi’s deep musical roots and impact on modern music, as well as celebrates a broad range of musical styles recognized by the GRAMMY Awards®, such as pop, rock, jazz, hip-hop, classical and gospel. Mississippi’s legendary contributions to music history include Jimmie Rodgers, Elvis Presley and B.B. King. The $20 million Mississippi Museum was designed as a joint venture by Dale Partners Architects P.A. of Jackson, Mississippi, and Eley|Barkley, P.A. of Cleveland, Mississippi. The Los Angeles Museum’s executive director Bob Santelli and deputy executive director Rita George supervised the museum project design team. Overseeing the Museum’s glass lobby and exterior, Flagstar Construction Company Inc. of Brandon, Mississippi, worked closely with Raymond Glass Company, Inc. The glazing contractor team from Raymond, Mississippi installed Tubelite’s 400 Series curtainwall with 7.5- and 10-inch-deep aluminum framing members. Making installation as easy as possible, this curtainwall uses an exterior screw-applied pressure bar to secure the glass in place. Meeting the specified performance design criteria, the system can withstand winds of up to 90 miles per hour. Additional systems for the Museum included Tubelite’s E14000 Series storefront and Medium Stile Doors. Linetec painted all of Tubelite’s systems’ aluminum framing in a Bone White color for long-term durability with minimal maintenance. “We regularly receive compliments on our facility from visitors and the modern, open design makes it ideal for special events,” said Emily Havens, executive director of GRAMMY Museum Mississippi. The Museum utilizes advanced technology to explore various musical styles through more than 15 permanent exhibits. “Mono To Surround” allows visitors to hear the evolution of sound through a custom listening experience, while “History Of Dance” features a touch-sensitive, multicolored dance floor and dance tutorial video. Exhibits, such as “Mississippi Music Legends,” “Mississippi Music Bar” and “Mississippi Music Trail And Timeline,” will explore the state’s musical history and unique culture. Other exhibits explore subjects such as songwriting, producing and the history of guitar. In addition to permanent exhibits, the Mississippi Museum presents special exhibits throughout the year. Its inaugural special exhibit, “Ladies And Gentlemen … The Beatles!” provided fresh insight into how The Beatles impacted America in the 1960s and beyond. “Pride & Joy: The Texas Blues of Stevie Ray Vaughan” runs through February 2017. Built and operated by the Cleveland Music Foundation — a non-profit organization developed in 2011 — the 28,000-square-foot GRAMMY Museum Mississippi is housed near the campus of Delta State University, home of the Delta Music Institute’s Entertainment Industry Studies program, which features the most unique audio recording facilities in the South. Similar to its sister Museum — the GRAMMY Museum at L.A. LIVE — GRAMMY Museum Mississippi is dedicated to exploring the past, present and future of music, and the cultural context from which it emerges, while casting a focused spotlight on the deep musical roots of Mississippi. The Museum features a dynamic combination of public events, educational programming, engaging multimedia presentations, and interactive permanent and traveling exhibits, including a Mississippi-centric area that introduces visitors to the impact of Mississippi’s songwriters, producers and musicians on the traditional and modern music landscape. For more information about GRAMMY Museum Mississippi, visit www.grammymuseumms.org. For breaking news and exclusive content, follow @GRAMMYMuseumMS on Twitter and Instagram, and like “GRAMMY Museum Mississippi” on Facebook. For behind-the-scenes access, add us on Snapchat at GRAMMYMuseumMS.